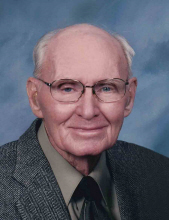 Mr. Marion “Bud” Vander Laan, age 98, of Orange City, passed away on Tuesday, April 2, 2019, at the Happy Siesta Care Center in Remsen. There will be a funeral service on Monday, April 8, at 2:00pm, at the First Reformed Church in Orange City. The Rev. Mark Haverdink will officiate. Interment will follow the service at the West Lawn Cemetery in Orange City. Visitation with the family will be on Sunday, from 2:00pm to 4:00pm, at the Oolman Funeral Home in Orange City. Marion was born on September 18, 1920, on a farm south of Boyden, the son of John and Stella (Vander Maten) Vander Laan. He was raised on a farm north of Maurice and attended the Maurice Public School. After graduating, he worked for area farmers and as a mechanic at De Jong Brother’s Garage until enlisting in the United States Army Air Corps in November of 1942. He served with the 383rd Bomber Group as an aerial photographer, taking photos later used in combat. On August 10, 1943, he married Dorthena Jean Van Gorp in Orange City. They made their home in Orange City where he continued to work for De Jong Brother’s Garage and later Silent Sioux Oil and Van’s Super Service Dodge and Plymouth. “Bud” also delivered milk for the Orange City Creamery and Well’s Blue Bunny Dairy for 27 years. Mr. Vander Laan was a member of the First Reformed Church where he had served on the consistory, as a teacher and superintendent for Sunday School, and as a youth group leader. He was also an active member of the Pressman-Kosters American Legion Post 329, a Cub Scout and Boy Scout leader, and donated and volunteered with the Siouxland Blood Bank. Bud enjoyed fishing, hunting, camping, bowling, softball, and traveling to visit family. Survivors include his wife of more than 75 years; six children and their spouses, Marion Dean “Butch” and Linda Vander Laan, of Maurice; Leon and Hisako Vander Laan, of Essex, Massachusetts; Rachel and Ronnie Sims, of Spring Branch, Texas; Gloria Clark, of Overland Park, Kansas; Mark and LeAnn Vander Laan, of Elk Point, South Dakota; and Debra Wallace, of San Antonio, Texas; fifteen grandchildren, Carrie McKee, Jonathan Vander Laan, Erin Vander Laan, Bobina Vander Laan, Tiffany Vander Laan, David Sims, Heather Clark, Jessica Soesbe, Danielle Vander Laan, Joshua Vander Laan, William Wallace, Chloe Wallace, Jayme Brown, Peggy Shulz, and Kimberly Hansen; sixteen great-grandchildren; one great-great-grandchild; a brother, Harold Vander Laan, of Orange City; three sisters-in-law, Lena Vander Laan and Joyce Van Gorp, both of Orange City; and Vera Leu, of Sioux Falls; a brother-in-law, Darwyn Van Gorp, of Asheville, North Carolina; and many nieces and nephews. In addition to his parents, he was preceded in death by his wife’s parents, William and Artie Van Gorp; a son-in-law, Jimmy Clark; four siblings, Luke Vander Laan, and his wife, Etta; Herman Vander Laan; Clarence Vander Laan; and Lorena, and her husband, Marion Ten Napel; two brothers-in-law, Bill Van Gorp and Larry Leu; two sisters-in-law, Muriel Vander Laan and Jeannine Van Gorp; and three nephews, Philip Vander Laan, Dave Vander Laan and Lyle Lee Vander Laan. Memorials may be directed to the Pressman-Kosters American Legion Post 329 or the Siouxland Blood Bank. To send flowers or a remembrance gift to the family of Marion "Bud" Vander Laan, please visit our Tribute Store. "Email Address" would like to share the life celebration of Marion "Bud" Vander Laan. Click on the "link" to go to share a favorite memory or leave a condolence message for the family.